How to Design Around Honey Oak | H.Prall & Co. Okay, I just have to say it…there was a lot of honey oak used in the late nineties, early 2000’s—and basically, most people don’t want it around anymore. I get it. It has a yellowish hue, it doesn’t look up-to-date, and most of all…it’s everywhere. There are a few options to deal with the oh-so-prevalent wood. Paint it. This is the route a lot of folks are taking, and it ends up looking really nice! 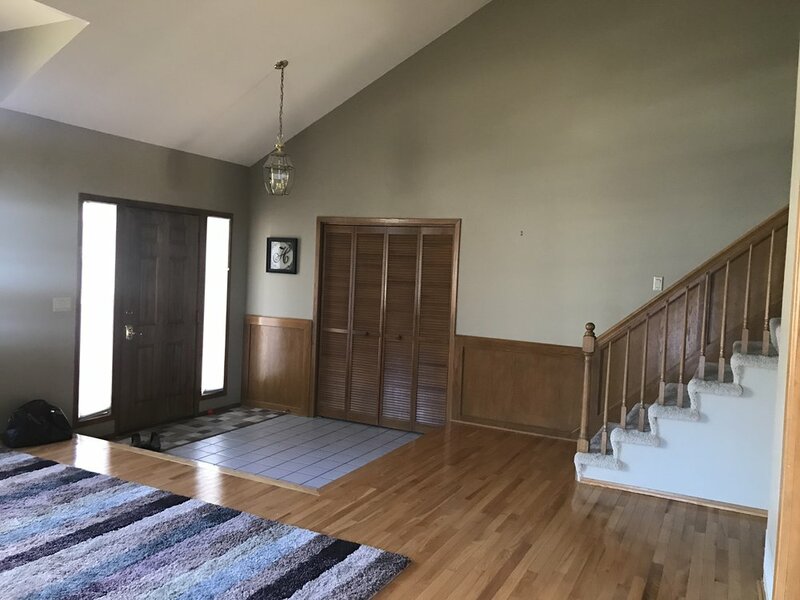 Now, I know that some people (ahem, men) are averse to painting wood, but here’s the deal…most of the honey oak we see in homes isn’t that nice of a wood. Also, there’s so much of it, that none of it stands out as a focal point, because there’s just plain so much! Replace it. If you have buckets of money and time on your hands…by all means, do this! It will hold up better than painting and you can customize the look. But seriously, it’s going to take you a lot of money to replace all the trim, cabinetry, etc. in your home. A lot. Work with it! I know. I know. You’re tired of looking at all that golden trim work. It can be done, though and look amazing! You’ll want to lean toward a cleaner, modern style to update the more traditional look of the honey oak. Also, adding cooler colors, will help the overall look skew away from the yellow-y, warmness of the wood. I had the opportunity to work in a late-80’s home last spring that was full of the honey oak glory. 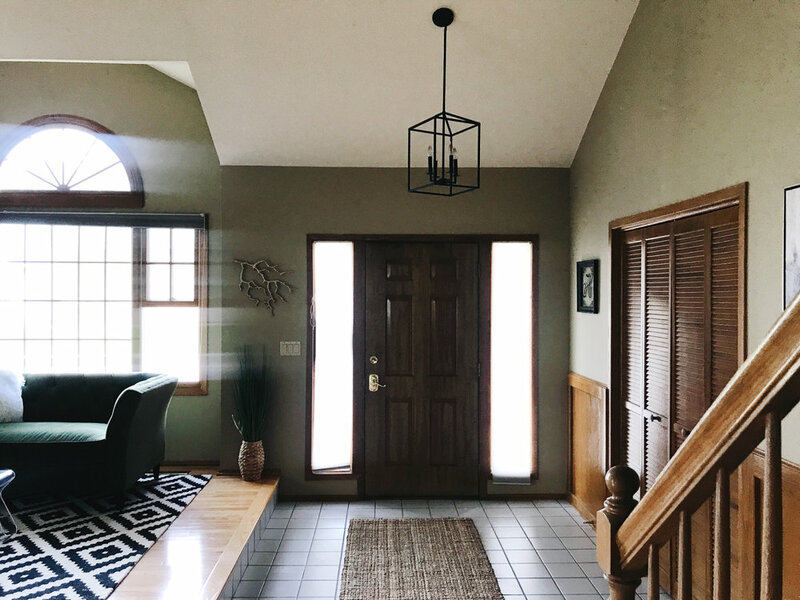 The house itself has fantastic light, vaulted ceilings, and a great traffic flow. It also has lots of yellow oak trim, built-ins, and custom features. The homeowners did not want to paint and weren’t going to be replacing the wood accents any time soon. They were ready for a major update, though, on everything else, including furniture, accessories, and lighting. 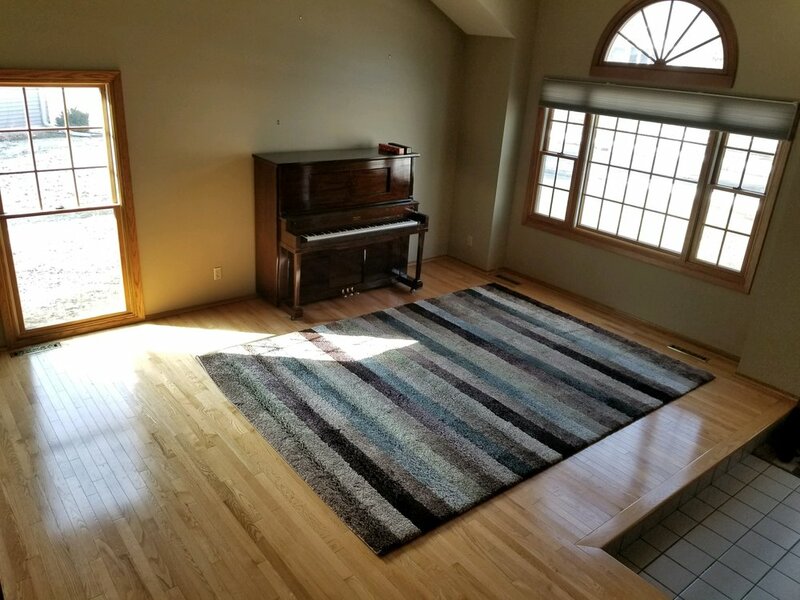 I was able to work with a piano the client already had (a family piece) and build the room from there. 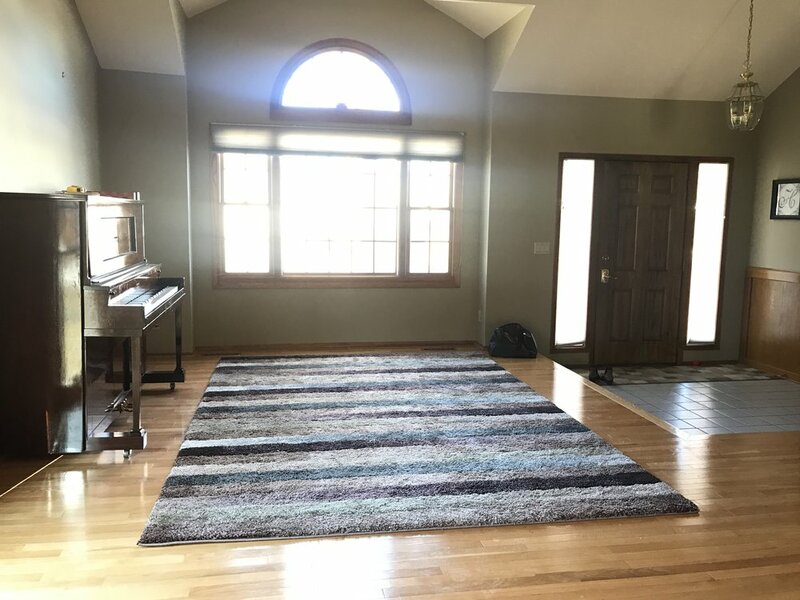 This allowed us to focus on items that would work to enhance the positives of the space and detract attention from the wood accents that the homeowners didn’t love. The style of the space ended up being a mix of pieces with a mid-century modern bent and more traditional pieces to keep the space warm and inviting. We incorporated different textures, such as velvet, leather, and woven accents that work together to make the room interesting, without overwhelming the space with color. 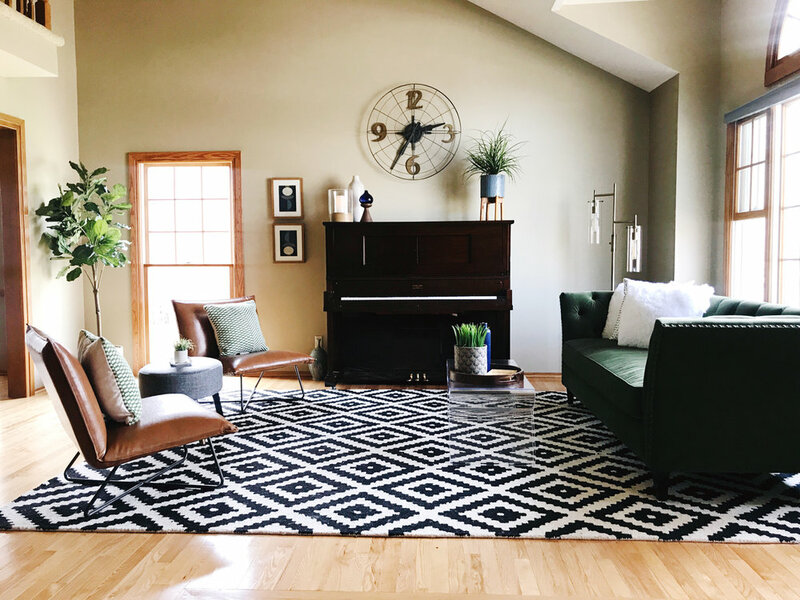 The area rug and sofa are the two wow-factor pieces in the space, but there are really several pieces that made this transformation work on many levels! We added accent lighting, changed out brass-toned over-head lighting to a more modern black-finish lantern-style chandelier, and layered pops of blue and green with art, accessories, and faux-plants. The homeowners now have a space that they can be proud to host guests in, and simply enjoy themselves. 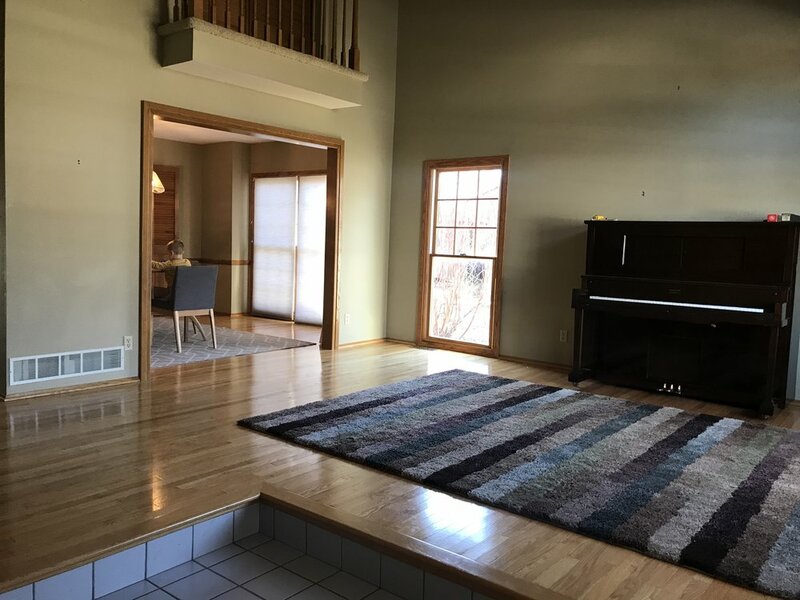 I love how light and bright it looks now, and that we were able to take some of the attention away from the woodwork they didn’t love and turn it toward the beautiful furniture, accessories, and lighting instead. This process was also much easier on the homeowners’ budget. We made big impact without breaking the bank. This project is a great example of what you can do with a vision and a willingness to work with what you have, instead of feeling the need to change such a huge part of the space. 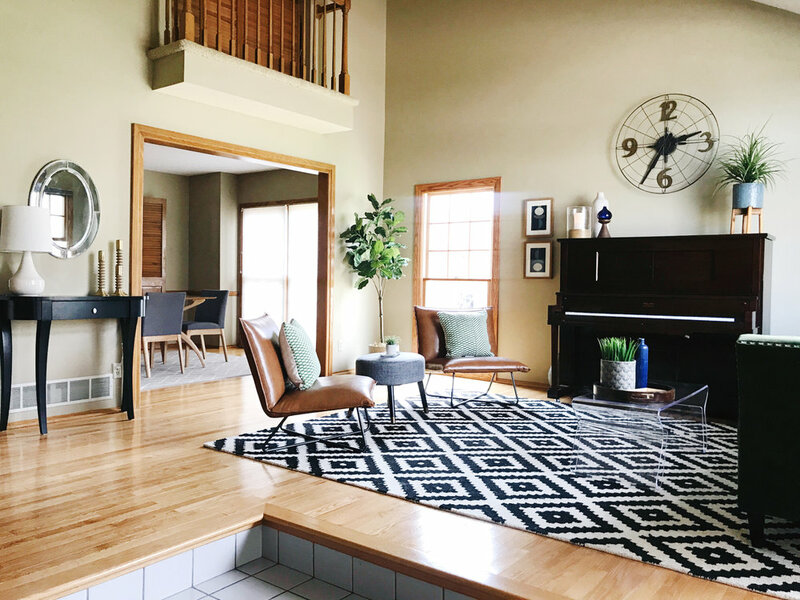 There is potential for the homeowners to paint certain aspects of the woodwork or install new flooring, as their budget allows, but for now, the space makes a wow-statement all on its own! If you have a similar wood situation, consider updating your “things” and work with the trim, cabinetry, and flooring that you have. You might be surprised at how it looks just by switching out those items, without doing a complete overhaul. Barn Doors for the Win!